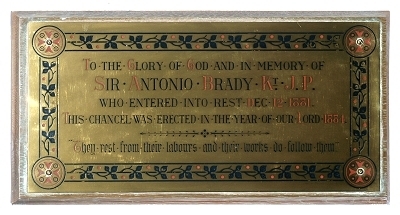 SIR ANTONIO BRADY KT J.P.
WHO ENTERED INTO REST DEC 12 1881. "They rest from their labours and their works do follow them"
Sir Antonio Brady was born at Deptford on 10th November 1811 and baptised at St. Paul's, Deptford on 9th December. He was educated at Colfe's School, Lewisham, and entered the civil service as a junior clerk in the Victoria victualling yard, Deptford. He was gradually promoted until he was made the first superintendent of the Admiralty's new Contract Department in 1869. He retired the following year and was knighted by Queen Victoria at Windsor on 23rd June 1870. In 1837 he married Maria Kilner at All Saints, West Ham, they set up home at Stratford Green, later moving to The Grove and, finally, Forest Lane. They had four children, Nicholas, Fanny, Elizabeth & George, who were all baptised here at St. John's. Nicholas joined the church and became Rector of Wennington, Essex. Fanny was married in 1865 here at St. John's to Ven. William Emery, Archdeacon of Ely. Elizabeth never married and lived with her parents for most of her life. George died at the age of six and was buried here in 1851. After his retirement Sir Antonio devoted himself to social, educational, and religious reform. He was associated with church work of all kinds. In 1869 He published "The Church's Works and its Hindrances, with suggestions for Church Reform". Through his exertions Holy Trinity, Canning Town, was built in 1857 and the establishment of the Plaistow and Victoria Dock Mission, the East London Museum at Bethnal Green (now The Museum of Childhood), and the West Ham and Stratford Dispensary were in a great measure due to him. Having taken a great interest in the preservation of Epping Forest for the people, he was appointed a judge in the Verderer's court. Brady was a member of the Ray Society, the Palaeontographical Society, the Geological Society, The Thatched House Club and the Essex Field Club. He was Vice Chairman of the Stratford and West Ham Gas Company, Treasurer of the Stratford Division of the South West Essex Benefit Society, Chairman of the General Purposes Committee of Stratford School Board and a trustee of the Penny Bank. He also served as a Justice of the Peace for Westminster. Around 1844 he began collecting fossils found in the brick pits at Uphall in Ilford. He was a friend of the owners and was notified whenever anything was uncovered. In order to ensure that the fossils were preserved he would reward the finder and compensate the workmen for loss of earnings while work stopped to excavate the finds. His finest specimen, found in 1864, was a complete mammoth skull with both tusks. Brady relinquished his claim to this specimen in favour of the British Museum. He spared no effort to excavate the fragile fossil bones and used plaster of Paris, strong boards and nail bar iron. Brady eventually sold his specimens for £525 to the British Museum in 1874. A catalogue of his specimens, compiled by William Davies, was privately circulated in 1874. This listed 888 remains including lion, fox, brown bear, mammoth, elephant, rhinoceros, horse, giant deer, red deer, deer, bison, aurochs, hippopotamus. He died suddenly at his home at Maryland Point and was buried in St. John's on 16 December 1881. His lasting legacy is his magnificent collection of fossil mammalian bones from the Pleistocene brick earth and gravels of Ilford, Essex, about 210,000 years old, which are still housed in the Natural History Museum. If you have any further information regarding this memorial, or the people named on it, we would be most grateful for a copy of it.